an informative blog featuring a directory for creative online businesses. They’ve got a lot of great information over there. You may want to give it a try. Sometimes it’s the simple things that make life great. Snuggling up with little twin boys to read a story…. Playing a good card game with friends…. life pretty great, wouldn’t you say? Sometimes the simplest of recipes can be wonderful as well. Chocolate Toffee Cheesecake for breakfast, lunch and dinner. But I think I may have heard someone say that kind of activity causes brain cancer or something. 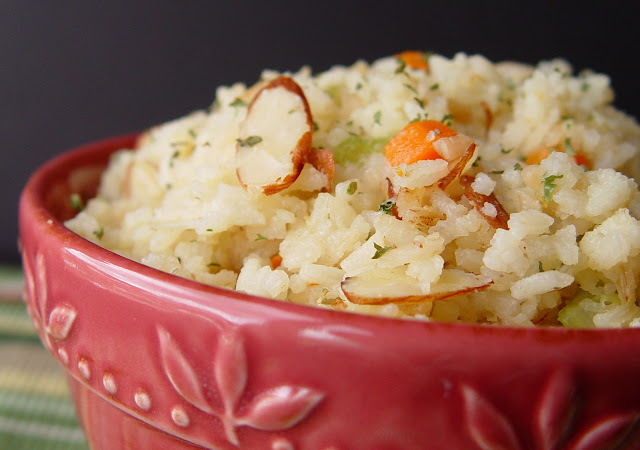 This simple Rice Pilaf with Almonds, however? Eat it all day if you want to! I have to admit I’ve been snacking on it a lot these past three days. 1. Chop your carrot and celery. 2. Drop 2 T of the butter into a large, hot skillet. and the rice to the hot pan. until some of the rice turns golden brown. and a bit of salt and pepper. Bring the mixture to a boil, then reduce the heat to medium, cover the pan and let it simmer for about 15 minutes, of until the rice is cooked through. 7. When the rice is cooked, remove the pan from the heat. Add 2 T butter…. and the parsley flakes. Stir to combine and taste the concoction. Add a bit more salt and pepper if needed. 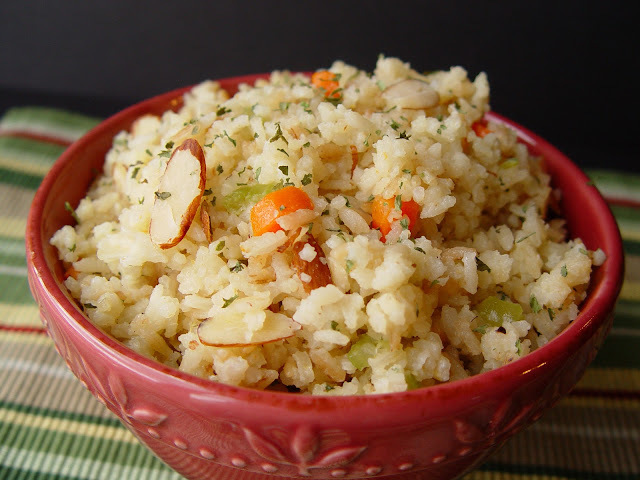 Have you ever made this recipe using brown rice? I haven't tried this exact recipe with brown rice. I'm sure you could use it…however brown rice takes a lot longer to cook and needs more water than white rice. I would up the broth to 5 1/4 C for this recipe if using brown rice. Thanks! Have a good one! I could seriously eat this every day for a week and not get tired of it! It is absolute perfection!! Wow yummy looking..I have never made rice Pilaf ! Gonna give a try. Jamie, I was wondering if I could make this in my rice cooker? I would stick with the skillet method for this recipe. It will give it a lot more flavor. Good luck! I am currently making this recipe for the second time; it is boiling as I type! It is FANTASTIC! Super yum! Make some every day if you feel so inclined…I do! Thanks for a great recipe. I am going to try it with brown rice next time (I do love me some white rice, though).